(Frank) Alexander Wetmore (1886-1978), ornithologist, avian paleontologist, conservationist, and science administrator, was the sixth Secretary of the Smithsonian, serving from 1945 to 1952. The first Smithsonian Secretary to receive a PhD, Wetmore began his career as a museum assistant and then spent almost fifteen years as a field biologist for the US Biological Survey. He joined the Smithsonian staff in 1924, serving in a variety of administrative positions until his election as Secretary in 1945. He continued an active research career throughout his Smithsonian years and was instrumental in developing research programs in tropical biology. 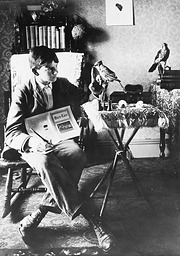 Wetmore was born in North Freedom, Wisconsin, the son of a country physician, and developed an early interest in birds. At the age of eight, he made his first field journal entry—an observation on the pelican recorded on a family vacation to Florida in 1894. His first published paper, "My Experience with a Red-headed Woodpecker," appeared in Bird-Lore in 1900. By the time he entered the University of Kansas in 1905, Wetmore had made extensive natural history collections around his Wisconsin home and in Independence, Kansas. Shortly after his arrival in Lawrence, Kansas, Wetmore received his first museum job as an assistant at the University Museum under Charles D. Bunker. Wetmore received a BA degree from the University of Kansas in 1912, and continued his education in Washington, DC, receiving an MS in 1916 and a PhD in 1920 from The George Washington University. Wetmore's career in the federal government began in 1910 when he was appointed as an agent for the Biological Survey, a bureau of the US Department of Agriculture. During the summers of 1910–1911 he assisted on field investigations in Wyoming and Alaska. He traveled to Puerto Rico in late 1911, and spent nearly a year surveying the bird life there and on adjacent islands. In 1913, Wetmore was promoted to assistant biologist with the Biological Survey, and he moved to Washington, DC, to begin work in the program on the food habits of North American birds. His career with the Biological Survey was highlighted by constant field investigations which took him to most of the United States, as well as Canada, Mexico, and South America. Among his more important investigations were a study of the causes of waterfowl mortality around the Great Salt Lake, Utah, 1914–1916; a survey of North American birds that migrated to the southern part of South America, 1920–1921; and the leadership of the Tanager Exploring Expedition to the islands of the mid-Pacific, 1923. Wetmore was promoted to the rank of biologist with the survey in 1924, but grew to believe that work with the survey was too bureaucratic. In November 1924, Wetmore accepted an appointment as superintendent of the National Zoological Park remaining at the zoo until March 1925, when he was appointed Assistant Secretary of the Smithsonian in charge of the US National Museum. Wetmore held this position for nearly twenty years, until 1945, when he was elected the sixth Secretary of the Smithsonian. Wetmore's administration of the US National Museum and Smithsonian during the era of the Great Depression and World War II faced many constraints. During the economic crisis, Wetmore worked hard to keep employees on the payroll and often personally financially assisted those in need. Despite a federal budget cut of 30 percent, he managed to continue the Institution's basic research aims, while instituting improvements in its administrative operations and exhibits program. Among his most important accomplishments was a move toward professional management of the Institution by hiring specialists such as John E. Graf and John L. Keddy to assist with federal budgetary procedures and other administrative matters. He also steered the Smithsonian toward a period of exhibit modernization, which was realized after his retirement. Two new bureaus were added to the Smithsonian during Wetmore's tenure as Secretary—the National Air Museum (now the National Air and Space Museum) and the Canal Zone Biological Area (now the Smithsonian Tropical Research Institute). Wetmore had been affiliated with this tropical biology station on Barro Colorado Island since its founding in the 1920s, and he arranged for its transfer to the Smithsonian to ensure that the station would have a stable financial and administrative base. Despite his administrative responsibilities at the Smithsonian, Wetmore continued an active research program in the field and the laboratory. He conducted several collecting expeditions to the American tropics between 1927 and 1940. When the outbreak of World War II restricted travel outside the country, he undertook a study of the birds of Shenandoah National Park in nearby Virginia. In the mid-1940s, Wetmore began a research program that would occupy his energies for the remainder of his life. Between 1946 and 1966, he took annual trips to Panama—making an exhaustive survey of the birds of the isthmus. This work culminated in the publication of his magnum opus, The Birds of the Republic of Panama. He maintained strong ties with Latin American biologists serving as US representative to the Pan American Union's Inter-American Committee of Experts on Nature Protection and Wildlife Preservation in 1940, to assist cooperative conservation efforts in Latin America. He also worked to protect the Galapagos Island during World War II and helped to organize the Pan-American Section of the International Council for Bird Preservation. In 1940, Wetmore also served as secretary-general of the Eighth American Scientific Congress, held in Washington, DC. 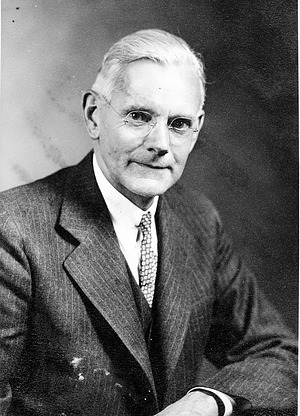 Wetmore retired in 1952 and became a research associate of the Smithsonian, where he continued his work on recent and fossil birds. Wetmore was widely recognized as the dean of American ornithologists, and he worked extensively in the field of avian paleontology and as a systematic specialist. His bibliography contains over seven hundred entries; including 150 papers and monographs on fossil birds. He described 189 species and subspecies of birds new to science. Wetmore made enormous natural history collections, which were eventually donated to the Smithsonian. Included were 26,058 bird and mammal skins from North America, South America, Central America, and the Caribbean area; 4,363 skeletal and anatomical specimens; and 201 clutches of birds eggs. Wetmore guided the Institution through the trying years of the Great Depression and World War II with a steady hand, and initiated the post-war revitalization of the Smithsonian. A quiet and gentle man, Wetmore was as at home in a remote Panamanian village as the halls of the US Congress. He worked with a wide range of conservation organizations throughout his life, leaving a legacy of preservation as well as study of the natural world.